After being a little on the fence as to whether or not I was going to pick this book up I'm so glad that I did! It was a real improvement from book one and I loved where the story went. I am back with another book review, Obsidian and Stars by Julie Eshbaugh. 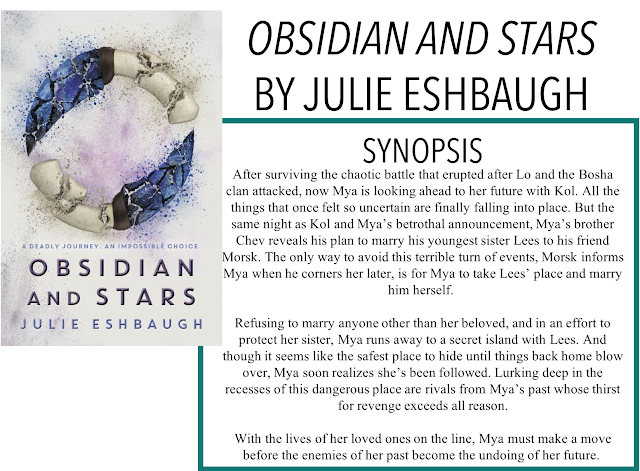 This book follows Mya's perspective, told in first-person (as opposed to Kol's second-person perspective we got in book one) and picks up pretty much where book one left off. I won't say too much because a lot happens in this book and I don't want to spoil anything, but I will say this book is filled with adventure, death, romance, and survival. While the romance of book one left me with a lot to be desired, this book really picked up the slack. I could feel a connection between the characters and I was able to see them together - something that I thought was missing from book one. I really enjoyed the familial connects as well outside of the romantic ones; you could really tell that the characters cared about one another, even if they didn't always say it. I thought the plot was really well done, I wasn't sure what Eshbaugh would have to work with after the unique storyline of the first book but she really pulled it off. I got some Lord of the Flies vibes, which I was here for and just a constant sense of movement throughout the plot. There really was not a dull moment in the storyline once things got going. As I mentioned, the perspective in this book switches to the typical first-person instead of second-person. Even though this took away some of the uniqueness of the books, it made the most amount of sense. There was a reason Kol was telling the story of the first book in second-person - and there is a reason it's switched now. I think the setting and storyline are enough to help the book stand out, even without the different narrator perspective. Overall, I really enjoyed this one and if you are looking for a story that is a little bit different, I would highly recommend you check out this series!